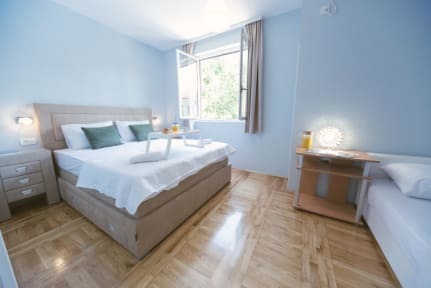 Explorer Hostel i Podgorica, Montenegro: Reservér nu! Our hostel is a pleasant place to rest and meet other guests. A comfy common room with LCD, table games, computer, big terrace and guest kitchen will make you feel inspired all the time and allow you to mingle with other travelers. 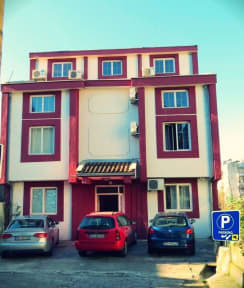 200 meters from Hostel you have supermarket, bakery, cafe, pizza bar and grill 5 minute walk is a main green market and shoping center. The main square as well as the historical part of the city are a 5-minute walk from our hostel. Hostel organize the cheapest transfer from the airports in the region, and also other distances on your request. Tourist Tax (0.90 EUR/person/night) not included. Few words more about location: Read the directions here on Hostelworld on how to find us, they’re easy and precise. The hostel is located in a separate building, surrounded by greenery and hidden from urban noise, this hostel offers the best environment for a pleasant stay, and at the same time close to all city attractions and the city center.